Employees | Stakeholder Engagement | About Us | NIKKISO CO., LTD.
We strive to create a better working environment for everyone and become a company where all employees can realize their full potential and feel valued. Here are some of the things we do to help employees develop their career, manage their health, and build interpersonal relationships with one another. We plan and provide various types of training, including training appropriate for employees' age and rank, skill training tailored to responsibilities and duties, selective training, as well as opportunities to attend external seminars where employees can get to meet people from other industries. Training for future managers is conducted where employees from across different divisions participate in a discussion with the management team. The Future Committee is a year-long project where mid-level employees selected from all business divisions work on a single topic with a focus on the challenges facing Nikkiso, its ideal future, etc. They exchange opinions and have discussions at study sessions, visit companies, conduct personnel exchanges, and hold meetings, and finally make a proposal to the management team. It's a voluntary activity where employees set up a schedule and select a topic all on their own. Each year the committee has been organized by employees from sales, engineering, manufacturing, affiliates, and more. 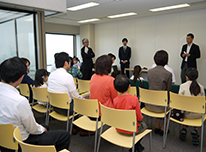 A meeting with the President, which gives employees an opportunity to talk directly with President and CEO, Toshihiko Kai, is held at the Head Office and each plant. During the meeting the president shares his ideas about company management and exchanges opinions on common topics with employees. The exchange goes a long way toward deepening the mutual understanding between the president and employees. Providing employees with an opportunity to have a dialog with the president has been part of our company's culture since its early days when the founder Keijiro Oto was at the helm although the format has changed over the years. We have a wide range of programs designed to keep making Nikkiso a technology expert. As part of this effort, we provide incentives for inventions and encourage employees to get patents. Incentives are provided at different phases, including when a patent application is filed, when a patent is registered, and finally when the patent is executed (applied to a product). Once a patent is applied to a product, an incentive is provided in accordance with how much it adds to the bottom line. We continually work towards building a better workplace. We provide managers with mental health and harassment training to help them get a good handle on related issues with an eye to early detection and prevention. We are currently working to expand the scope of training to include all employees. Employees are also provided with access to external expert organizations which they can consult with on issues related to health, home nursing care, and more. We host Family Days to give employees' families an opportunity to see our workplaces. Featuring events like an experiment illustrating how dialysis works, etc. Family Days can help employees' families better understand what we do and how we work. Family Days are also held at the Higashimurayama Plant, Research & Engineering Institute, Kanazawa Plant, and Nikkiso Vietnam, Inc.
We encourage employees to participate in club activities and community events to foster friendly interaction among one another. Nikkiso offers employees a host of activities, including everything from baseball to soccer, kyudo (the Japanese martial art of archery), tennis, ping-pong, running, cycling, flower arrangement, and tea ceremony clubs. 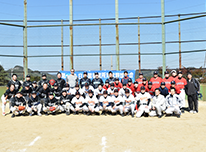 Employees of all ages from around the world participate in the annual inter-office baseball tournament. 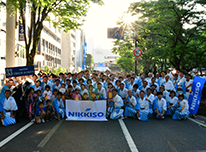 Kanazawa Plant employees participate in the Hyakumangoku Parade, one of the events featured in the Kanazawa Hyakumangoku Festival celebrating the culture and tradition of the area that was once known as Kaga. About 200 employees and their families wearing the same yukata (summer kimono) chant together as they dance down the streets. The event really brings everyone involved together. Employees across the Nikkiso Group participate in QC circles with an aim to improve quality. QC circles from not only Japanese locations but also Vietnam and China get together for an annual company-wide QC circle presentation event to present and share their initiatives and inspire one another to make further improvements. The event also serves as an opportunity to interact with employees from different locations.